The first weekend of March was gorgeous for croquet, although Sunday turned a little chilly. The Pinehurst Croquet Club hosted a weekend clinic organized by the North Carolina District of the USCA. Forty-seven enthusiasts turned up for two days of instruction from national and international champions Paul Scott, Danny Huneycutt, Andy Short, Jeff Soo, and Pinehurst’s own Bob Cherry and Ron Lloyd. The participants, who came from North and South Carolina, Virginia, and even Pennsylvania, spent two beautiful Pinehurst days studying the laws and strategies of International (Association) Croquet. 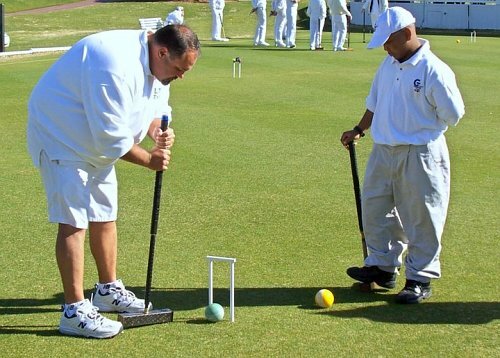 This game is played at many clubs and tournaments in the USA and in most other croquet-playing countries. Association Croquet is somewhat simpler [arguably — Ed.] but more challenging than the American rules game, and involves more interesting long shots and dizzying angle, split, and roll shots. The recent MacRobertson Shield quadrennial tournament in Australia was an International rules tournament. A feature of the weekend was the arrival of nine members of the Gamewell Croquet Club from the Gamewell Middle School in Caldwell County (near Boone) These kids traveled 4½ hours to come to Pinehurst. They ranged in age from 12 to 15, and drew crowds who watched them take instruction from Pinehurst croquet pro Ron Lloyd and play heated matches of golf croquet, as well as the more formal American Rules croquet. Pinehurst Croquet Club members hosted the Gamewell players, who were accompanied by their coach, Bill Hartmann. Club President Jack Stevens and his wife Sarita had three girls staying at their home and Barbara and Horace Hayworth hosted two girls. Betsy Donaldson bravely housed all the boys. Needless to say, it was a lot of fun, and the hosts recovered from the weekend quickly. The GCC is a new club set up in Gamewell in 2005 by Bill Hartmann. The club is the only school team in the US which is a member of the US Croquet Association. Starting with only two students, the club now has 80 members, including several adults. The club membership is free to Gamewell students who maintain high GPA averages, and Bill has been able to construct two regulation lawns at the school athletic field, thanks to generous donations from local supporters. Pinehurst members and visitors enjoyed watching the very attentive and well behaved youngsters learning and playing matches during the 2½ days they were here, which culminated in several hotly contested games of golf croquet which enabled them to show off their considerable shot-making skills. On March 22–25 Pinehurst will host 24 players from all over the state for the qualifying rounds of the 2007 North Carolina Open Croquet Championships. The winners of these trials will compete in the NC Open championship rounds, which will be played at Pinehurst on April 12–15. Spectators are always welcome, PCC members are always happy to explain the rules and strategy of the games, and admission is free. The next following major croquet will be the US Croquet Association Southeast Regional Championships, held at Pinehurst May 15–20, to be played on 4 lawns at Pinehurst and one at Longleaf Country Club.